You’ll never listen to Green Day the same again. 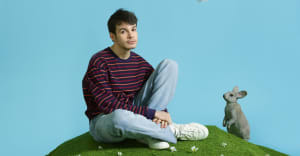 Rex Orange County is the latest artist to undergo the Nardwuar treatment. Watch his interview with the Human Serviette above. Nardwuar digs deep as usual and grills Rex on his days playing a rat on stage as a 12-year-old and also his unique cover of Green Day's "American Idiot." The interview was shot in Vancouver where Rex Orange County recently passed through on his North American tour. The run of lives dates continues until August 13 in Los Angeles. Check out the Nardwuar interview above and revisit The FADER mini-doc on Rex here.